Jacqueline Frances Stallone (née Labofish; born November 29, 1921) is an American astrologer, former dancer, and a promoter of women's wrestling. She is the mother of actor Sylvester Stallone, singer Frank Stallone, and the late actress Toni D'Alto (by her ex-husband Anthony Filiti). Jacqueline Frances Labofish was born in Washington, D.C. Her father, John Paul Labofish (15 January 1891 – 11 September 1956), was a Washington lawyer. Her mother, Jeanne Victoria Anne "Adrienne" Clerec (1896–1974), was French, from Brittany. Her parents had met while her father was serving in the US Navy at Brest (Brittany) after the First World War. Her paternal grandparents, Rose (Lamlec) and Charles Labofisz, were Jewish immigrants from Odessa, Ukraine. Her family lived with body builder Charles Atlas,[when?] who trained the family in gymnastics, weight lifting and jogging. Stallone was the first woman to have a daily TV show on exercise and weight lifting in Washington, D.C., and later opened a women-only gym, named Barbella's. During her youth, Stallone was a trapeze artist in a circus and a chorus girl in a nightclub. She was also a hairdresser. Her son Sylvester's father is Italian American Frank Stallone, Sr. She lived relatively quietly for most of her life. Even after Sylvester starred in the film Rocky in 1976 she remained unknown to the general public as his mother. Stallone appeared on the 1980s wrestling program GLOW: Gorgeous Ladies of Wrestling. Stallone was shown rapping with Americana, Mt. Fiji and Susie Spirit behind her. She rapped about Aunt Kittie's girls and making them kitty litter. Stallone became famous in her own right during the mid-1990s, by publishing astrology books, making television appearances, and setting up a psychic hotline where she would charge telephone callers for advice from her and other operators. She also invented the term rumpology, which, according to her, is an art similar to that of palm reading except that the procedure is done by examining pictures of people's rear ends. She also claims that she can consult dogs to find out about the future. She also became involved in the cosmetics industry, launching facial masks and other products that she claimed cured skin problems. On May 21, 1992, Stallone appeared on The Howard Stern Show and engaged in a heated on-air argument with Sylvester's dad, Frank Stallone Sr. She accused him of being horrible in bed and wanting to have Sylvester aborted. She said that she faked the abortion and that Frank did not know about it until she gave birth. Several curses were said and some were not censored. In January 2005, she appeared in the UK TV series Celebrity Big Brother as a "surprise" contestant. She was brought onto the show to create tension within the "house", as her former daughter-in-law Brigitte Nielsen, with whom she notoriously did not get along, was also a contestant. Stallone was the first contestant voted out by viewers after spending four days in the house. Stallone appeared on BBC TV show Through the Keyhole in March 2007. On the show, Stefanie Powers explored her LA home and then interviewed her. In 1994, Stallone was parodied in a Saturday Night Live skit in which Janeane Garofalo played Stallone. In the skit, Stallone advertised a psychic hotline telling of her two sons "Sylvester, the famous star, and Frank, a struggling musician". Stallone encouraged customers to call so she could steer them away from the "Frank" (negativity) in their lives and toward the "Sylvester" (success). Her appearance on Celebrity Big Brother 3 in the United Kingdom was parodied on the British TV comedy show French and Saunders, with Dawn French playing Stallone and Jennifer Saunders playing Brigitte Nielsen. In Absolutely Fabulous, 1997 Season 1, Episode 1, entitled "Fashion", a character mistakes £300 worth of royal jelly for honey and eats it on toast, to which another character says, "This is the stuff that Jackie Stallone would kill for". 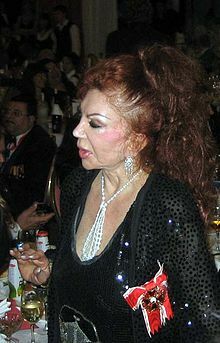 Jackie Stallone has three children and seven grandchildren. Her eldest grandchild Sage Stallone died unexpectedly in 2012. She has another grandson and three granddaughters through eldest son Sylvester, a grandson Rob Stallone through Frank and a grandson through her late daughter Toni Filiti. ^ Coquil, Alain (October 6, 2009). "Stallone est de Brest " même " !" (in French). Le Télégramme de Brest. ^ "Jeanne Clerec, la grand-mère de Sylvester Stallone : un destin Américain". Histoire-Généalogie (in French). Retrieved 2014-10-22. ^ "Sylvester Stallone's mother visited Odessa". Official Site of Odessa. Retrieved 2015-07-05. ^ "Mother of movie star Sylvester Stallone seeks grannie in Ukraine". ArtUkraine.com. Archived from the original on 2014-08-09. Retrieved 2015-07-05. ^ "Absolutely Fabulous - Fashion (Transcript)".